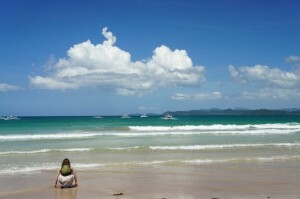 Home » Asia » Palawan Living: The Good, the Bad, and the… Unsanitary? 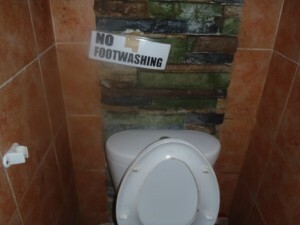 Palawan Living: The Good, the Bad, and the… Unsanitary? 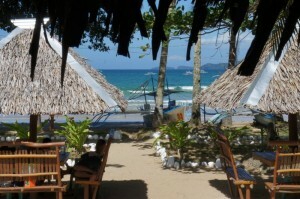 We got our first taste of the notoriously untamed islands of Palawan in Sabang. We first took a plane from Manila to Puerto Princesa and then spent 5 more hours on an off-road mini van. We teamed up with “Two wild and crazy” Czech guys and hard nosed our way to negotiating the mini van for $23 USD (split 4 ways!). The Czech guys were hilarious, insisting we stop to get beer for the long drive. One of them even had an accent that was a dead ringer for Steven Martin or Dan Aykroyd’s SNL character. I was an immediate fan. But the roads were so windy that everyone was too car sick to drink. (To sick to drink? I know I feel weird even writing it.) Sadly, our full beer cans tragically rolled around in the van, clinking together under our seat, not being given the proper attention. 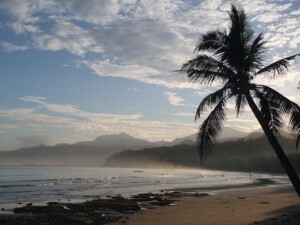 Finally we arrived in Sabang. This place was out of this world gorgeous. 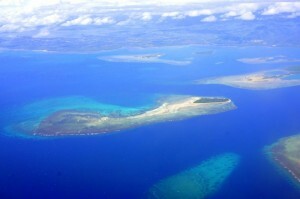 And after 5 miserable hours, all I was capable of thinking about was swimming out into that crystal blue ocean. Ah, paradise found once again on our travels. 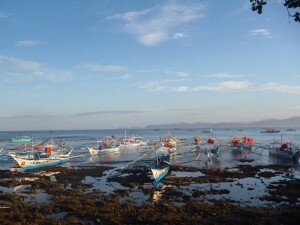 A fleet of traditional Philippine boats. Me: so close, yet so far away. I think this was just before I pleaded to the guys that I just wanted to touch it. Our hut was right on the beach. But only had electricity between the hours of 6 pm to 10 pm, making it difficult to see anything in our hut before noon. View from our hut's porch. 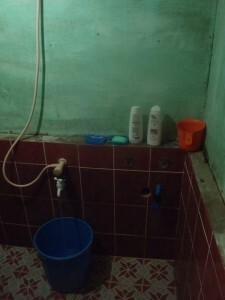 This is where I came face to face with my first traditional Philippine bathroom. The shower is a facet sticking out of the bathroom wall with a bucket underneath and another smaller bucket with a handle. To take a shower, you fill the big bucket with water, expect it to be cold unless there’s a water heater, then you use the handled bucket to dump water on yourself. The shower drain is a hole in the floor that funnels water into a mud puddle in the back of the hut. It sounds primitive but it’s a very relaxing way to shower. The toilet is just a porcelain bowl with no flushing mechanism. To be honest, I was pretty confused. Ben showed me that I had to use the handled bucket to dump water into the toilet bowl to flush. The extra water forces “everything” down by gravity, funneling “the everything” to the previously mentioned mud puddle in the back of the hut. Do not visit the mud puddle in the back of the hut. 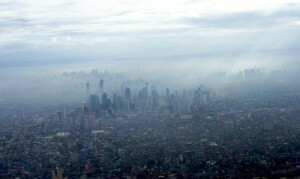 In fact, never walk to the back of any residential hut in the Philippines. At the airport and major tourist attracts there are some westernized toilets, but I think they confuse the locals just as much as their traditional toilets confused me. Just in case it's unclear. Do not visit the mud puddle in the back of the hut… You have a spectacular way with words and “what a READ”! Leah….SPECTACULAR!!!!!!!!!! I hope that you got all your shots before leaving! Keep up the fun. About the wasted beer…..your father will be disappointed in you. He will be disappointed. lol. My dad said that you were coming to visit tomorrow. Tell my family Hi for me! Funny stuff! Enjoyed! Try to stay clean.